I’m not going to write the blog about gay news. I can’t handle it. The more I read news about gay issues the more depressed I feel. My kind is so fickle and tiresome. If It’s legal for me to get married when I’m ready for it, then I will, if it’s not, then I won’t. The argument that the other side has about how gay men are so carelessly promiscuous that they wouldn’t know what to do with marriage even if they had it is honestly a pretty reasonable stance. Not that it hold water according to the law of course, nor is it reason enough to withhold the rights. Geeze, all this talk of the importance of family, I guess I am a Jarrett after all. I’m almost done with Physical Journal #5. It’s exciting, my ex, David, bought it for me on Halloween last year. He’s gone but the volume remains. Good trade off. When taking this picture I noticed that it smelled like age and knowledge and bookishness and fall leaves and love. This has made me happier than anything else. I think it’s the best journal I’ve ever owned. It’s certainly see some of the most difficult moments in my life. 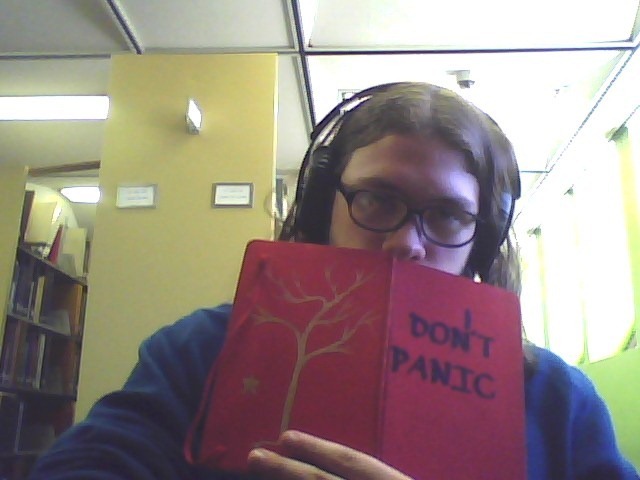 Other notes about the photo: hooray for library and big headphones.